Azul Hotels and Beach Resorts are the family brand of Karisma Hotels. Karisma bills its properties as "Gourmet Inclusive resorts," which are perfect for families who want a little pampering along with their adventure. These lodging accommodations are available in seven fantastic and diverse destinations including Mexico, Dominican Republic, Jamaica, Colombia, Croatia, Montenegro, and Serbia. The Azul Beach Hotel and Azul Sensatori are near the small town of Puerto Morelos in the Riviera Maya, located about 20 minutes from the Cancun airport. This is a beautiful location on the Caribbean coastline known for its long beaches. 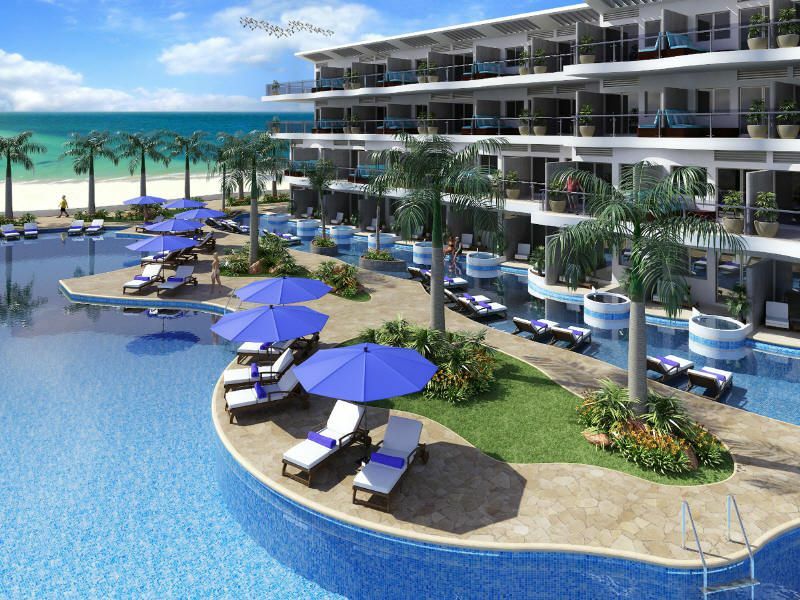 The Azul Fives is near the busy tourist town of Playa del Carmen further south. All three have great locations for exploring the Mayan Riviera including snorkeling and scuba diving, eco-theme parks, and more. The popular destination Tulum, which holds ruins of an ancient Mayan port city, is also close by. These hotels share great features like multiple a la carte restaurants, 24-hour room service, and a beach butler service. Azul Hotels also have a partnership with Fisher-Price toy company for programs for kids under four and accompanied by parents. Perfect for both families and couples alike, these resorts are happy to celebrate special occasions, like weddings, with benefits like premium liquors and adult-only areas and restaurants available at select resorts. The Azul Sensatori Hotel is located in Bahia Petempich, 20 minutes south of the Cancun airport. It's also 35 minutes north of the tourist shopping hotspot Playa del Carmen, 30 minutes from two golf courses, and only 10 minutes north of the small town of Puerto Morelos. This is a great selection for business travelers who want a little time on the golf course afterward and families who want a mix of sightseeing and downtime. The Sensatori can accommodate up to 438 rooms which all include a Jacuzzi, adults-only section and family section, and some suites that can sleep up to eight. Individuals who are obsessed with the water will love this cool, unique feature with swim-up suites where guests can step out of their room into a river that goes to the main pool. In fact, the three pools include one that's adults-only and one that's children-only. Let a handsome beach butler attend to your every need, from fluffing your pillows, to feeding you grapes (and other gourmet snacks), and slathering on your sunscreen. Other amenities include water vaporizers and even a full picnic on the beach. Trouble in paradise? We think not. Shaded cabanas and beach beds are also provided on the beach, and watersports like kayaks and Hobie cats are available for those seeking adventure on the water. Guests can also participate in fun activities like beach parties, Spanish lessons, yoga, and live entertainment. There is also an adults-only restaurant and lounge available along with a spa. With these hotels, you are taken care of. This resort has many features for families and some nice extras for babies and little kids. Babies will be provided with strollers, cribs, in-room play-pens, and refrigerators. Moms will be able to relax knowing that the resort has baby monitors, bottle warmers and bottle sterilizers, baby-sized plush robes, and baby food available. For kids under five, Azul Hotels and Fisher-Price participate in the Azulitos kid's program. Babies six to 18 months can enjoy playgroup sessions such as Ritmo de la Manana ("rhythm of the morning") using Fisher-Price musical-type toys, while toddlers 18-36 months can play along to "Mundos Maravillosos" ("marvelous worlds") with "Little People" toys. Finally, kids three to five can engage in Planet Heroes adventures, and those under four-years-old must be accompanied by a parent. With these activities, families will feel comfortable knowing their little ones are being entertained. Parents can also take their loved ones to explore the toy lending library, known as Jugueteca, which is part of the Azulitos program. There is also a Kids Club for ages four to twelve with foosball, a healthy snack bar, and other activities and games for children to enjoy. Kids four to twelve can also bounce and spring and jump to their heart’s content on a rope course, trapeze, trampoline, springboard, and magic carpet swing. Of course, teens aren't left out with the Teen's Club room for ages 13 to 17, equipped with video games including Wii, daily activities, a non-alcoholic bar, and even a teen dance floor. If that wasn't enough for the family, activities like kite-flying, toasting marshmallows, barbeques, and a DVD library with free popcorn are available, though some activities may incur a charge. Families can add to their stay by enjoying guaranteed connecting rooms and suites that can sleep at least two adults and three kids, a playground, and nanny services. There are also kids menus at restaurants, child-size bathrobes, and complimentary jogging strollers for the "Mom's Morning" jogging/yoga program. Mom will love this program designed just for her and her baby, plus a complimentary, healthy breakfast. The beach area is great for snorkeling but isn't good for walking or swimming. Families are encouraged to bring water shoes or head down the beach on either side. The beach has some seaweed that staff is constantly cleaning up, and at crowded times, you may have to get up early to claim a beach bed. In one direction further along the beach, there is a nudist beach nearby. Cash tips are suggested, so getting dollar bills in advance is recommended. Families should ask the front desk for updates on the kid's program, which can have limited hours, along with open and close times for the restaurant.